One of the big highlights of this upgrade is the new easy-to-use exclusion filters. Don’t want any trace of angst in your fluff? No problem! Just select “Angst” from the list of Additional Tags to exclude. If you can’t find the tag you want to avoid in the provided lists, just type them into the “Other tags to exclude” field. Want to get even more in-depth? There are some handy hidden search operators to help you find exactly what you’re looking for. It’s thanks to you that we’re able to operate and improve AO3. Everything from spam detection to new servers is paid for using money donated by people just like you. And it’s your contributions that let us hire reliable contractors to help out our all-volunteer main coding team and make major changes like our search upgrade a reality! You can check out our latest budget post for more information on how your donations are being used and what we’re hoping to accomplish with them in the near future. And it’s not only AO3! 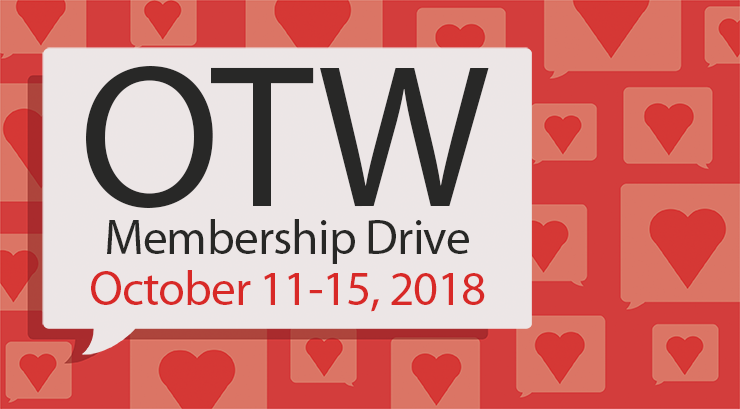 While AO3 is the OTW’s most visible and expensive project, we have a multitude of other projects that support fans and fanworks, and all of them need your support. Whether you’re a fan of our Legal Advocacy work, our Open Doors project, Fanlore, or Transformative Works and Cultures , you can help support them by donating today!